20 June 2012: [Extension] I am increasingly thinking about what to do with the south facing roof of our intended house extension. 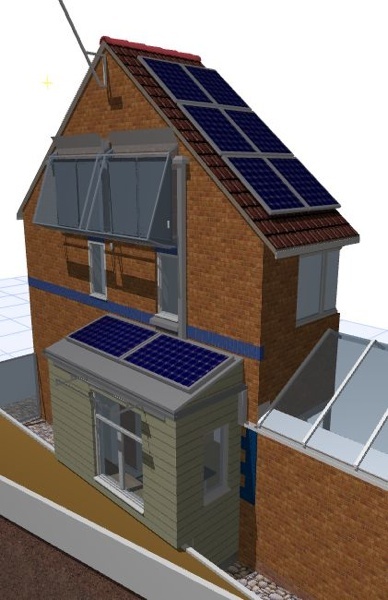 I cant let the opportunity of a south facing roof go to waste, and had initially thought of PV-Thermal as the answer. Now that the event draws near, I have been considering this in more detail, and have made contact with NewForm Energy who I met at EcoBuild 2011. Newform seem to be a company most in tune with what I am doing here, and have gone so far as to develop their own model of heat pump that can take solar heat directly, instead of going through the ground loop first. I wouldn't be able to do this with my IVT, without some modification. Actually,..... I can see how I could make an amendment to the circuit, with a controller operating a solenoid valve to make this possible - but I have to ask Ice Energy if the parameters of the heat pump can be changed to accommodate a warmer input temperature. Newform have several pages of case studies of solar earth charging already achieved, and which are listed in their case studies. In particular, there is one called Brambles (newbuild in Essex) and some holiday cottages in Cornwall which are using this. The most notable example for me is Walthamstow fire station with 188 sqm of PVT panels. They have also done solar-thermal-PV facade development at Warwick University. Two PV panels would provide enough electricity to meet all the annual energy needs of all my pumps, controllers, meters, PV webrouter, and more besides - making the operation of the solar charging truly carbon zero in all senses except in the embodied energy of the copper and glass. When they are all going full blast, they use 120 watts of AC power. The additional pump, controller and meter would add a little bit more, perhaps to 180 watts total, when all systems are running. Two square metres of Powertherm facing south would make an significant additional input to the thermal charging, and would be measurable. Although they are on the same loop as the Sunbox, I would put an independent energy meter on the PVT panels, and would take the reading of the existing Sunbox meter, and deduct one value from the other, so I know the individual performances. Putting an eco-friendly way of energy conservation can lead into brighter future. I had solar panels installed on my house last year, took me a while to make my mind up and find the money but I'm glad I did it. Getting paid by the government scheme doesn't hurt either! It was hard choosing from so many domestic solar pv systems but the company rep talked me through it and helped me through the process.